Energy awareness within Bristol City Council (BCC) has been the responsibility of the Energy Management Unit for over 10 years. Previous campaigns of awareness raising had been a bit "piecemeal" and lacked an element of co-hesion. Since Bristol joined the Display® Campaign in 2004, the Display® logo has been used as much as possible in newsletters, posters, postcards and stickers. For their exceptional municipal communication activities, Bristol City Council received the 1st prize in the Display® "Towards Class A Award" in 2006. The prize is a large electronic display screen personally designed ; which visualises building consumption data and savings in real-time. With this tool Bristol can present its Display® efforts to the public in a clear, colourful and didactic way. It is hoped that this electronic display will be in the councils main offices at The Council House and so will be visible to a wider range of Bristolians, from elected council members to those attending functions in the building. The global strategy The use of Display® as the basis for a cohesive energy awareness programme fits into the Eco-Management audit scheme (EMAS) – a management tool for companies and other organisations to evaluate, report and improve their environmental performance being implemented throughout Bristol City Council – specifically sections dealing with energy and water conservation. _ Furthermore, the Display® activities contribute towards the BRISTOL CLIMATE PROTECTION and SUSTAINABLE ENERGY STRATEGY that aim to cut waste of energy in council-owned, residential and commercial buildings. Posters on buildings The city of Bristol has not been shy to show the performance of its public buildings. They were the first city to display a very large poster on a prominent building. In 2004 a huge banner of 6 m2 was hung on the side of the CREATE Environment Centre which shows its performance in relation to energy and water usage and corresponding CO2 emissions. A poster of the same information was also displayed in the reception area. _ From September 2004 to March 2006, the Energy Management Unit in the City Council produced a total of 14 Display® Posters for municipal buildings such as, schools, libraries and also for council buildings. The posters proposed simple actions (such as turning off lights in empty rooms, turning off PC monitors at night, not leaving electrical equipment on stand by) and technical solutions (such as using flat screen PC monitors or replacement of electrical heating). _ The public response was very variable, depending on the performance of the buildings : In a building performing badly, it was considered e.g. that lights were on too much and toilets flush too often. Posters showing F or G ratings generally provoked debate and it was discussed on which areas the focus should be placed in order to make improvements. _ Users of the Council House, the headquarters of Bristol City Council (BCC), considered the building rating as used in Display posters to be a good idea. Much feed back came from staff in the form of Emails. At the CREATE Environment Centre, interest was shown from school children through to elderly. CREATE is an environment centre which hosts a range of events and exhibitions and also features a purpose-built Ecohome. Moreover, CREATE accommodates organisations working in the field of sustainable development, as well as Bristol City Council’s sustainability teams. _ On the BCC intranet there is a weekly poll on a topical subject to evaluate the public response to the Posters. The poll takes the form of a multiple choice. Energy awareness within Bristol City Council Regarding the Posters in Council buildings, an internal e-mail was sent to each employee after the posters were put up drawing attention to them. _ Other follow-up actions took place via various communication media. Stickers were distributed to the 150 Environmental Awareness Representatives (EAR’s) and Site Energy Officers (SEO’s) and also attached to around 250 internal mail envelopes which circulate throughout 450 council buildings. _ Additionally, two different types of Display Postcards were sent to Council staff showing, as the stickers, sleeping light bulbs and dozing monitors. _ Four types of awareness posters were put up in approximately 33 percent of the building stock. _ Display items were attached to the newsletter that circulates in the council’s core buildings which is also available on the internet and via internal e-mail. Dissemination activities through the media In autumn 2005, the Display® Campaign was announced in the Bristol News that is distributed to 182.000 homes. Articles about Display appeared in the "Energy Echo", the Energy Management Unit’s regular newsletter. News about the Campaign was also disseminated through the weekly e-mail newsletter of the BCC sent to approximately 6.500 employees. Finally, the Display Campaign is presented all day long on the Bristol City Council website. Display Competition A Display® theme competition open to staff and public alike was run in an issue of “The Energy Echo” which related to Display. Events Efforts have been made to promote Display® on the occasion of other energy and environmental related happenings. The Energy Management Unit (EMU) had a stand at the Climate Change Fayre in April 2005 publicising Display. This Fair is a free event to promote what local people and businesses can do to reduce their impacts on climate change. _ In September 2004 and 2005, open doors days were organized at the CREATE Environment Centre. "Eco-Living" Event (May 2006) : The fair is organised by Bristol City Council’s Sustainable City Team and is now in its second year. The scope is to offer advice in eco-issues and demonstrate the latest products for the home and garden. Among the sections of the fair : energy-saving and renewable energy, and water-saving. The EMU had a stand at the event which had prominent material promoting Display on it. _ Schools Environment Conference at University (August 2005) : The EMU had a stand at an event for 6th Form Pupils at 4 local schools – Display material was made available to them and an A2 example of a Display energy building label was used to illustrate the scheme to them. Training of staff volunteers to assist the Energy Management Unit Council Staff throughout the Council and wider Bristol are being trained in order to involve them in the dissemination of energy awareness principles. To achieve this objective, training sessions were organized by the EMU and the Sustainable City Team aiming at training the staff in basic energy awareness skills with a view to them undertaking "good house keeping measures" in their offices e.g. turning off lights and pc monitors etc. Display as a concept of measuring success in cutting energy and water waste is introduced in these sessions. Around half of the staff in the scheme (approximately 150 people) have received training on energy awareness in the workplace. Introduction of Display® into schools via "Eco Schools" Through the international programme "Eco Schools", the Display® scheme will be introduced into the 14 Bristol City Council Schools who are currently in the Eco Schools project. _ "Eco Schools" aims at empowering schools to analyse its operations and become more sustainable by reducing its environmental impact. 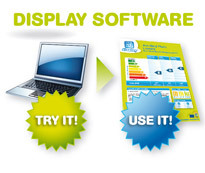 Display® is used as a visual tool to help children, teachers and parents to gage progress. _ The schools obtain regular meter readings with a view to calculating posters with accurate ratings. Reason for inclusion as Shining Example Bristol adopted an exemplary municipal communication strategy contributing to the Display® European climate campaign and has therefore to be included as a Shining Example. _ The performance is outstanding because of its creative concept and of its innovative use of materials : The stickers and posters that went out to employees and were distributed across the council’s buildings display imagination and flair in transmitting the message of Display®. _ Finally, this example sticks out by its targeting of different interest groups. On the one hand general action (especially the Display Posters visible in many buildings) focused on the public, on the other, specific action was undertaken for specific target group, namely the council staff. Efficient follow-up work has been done in the CREATE Environment Centre. Partners In order to achieve their goals within the Council, the Energy Management Unit set up a network of volunteers at various sites across the Council called "The Site Energy Officer scheme" that helps in reading gas and electricity meters on a regular basis, acting as a contact at their site for distributing awareness posters/stickers and being the eyes and ears of the Energy Management Unit, looking out for energy and water wastage at their site. _ The Environmental Awareness Representatives(EAR’s) are Volunteer members of staff who serve as contacts at council buildings. They help distribute energy awareness material and promote good practise in energy and water saving to their colleagues. _ Both the Environmental Awareness Representatives Service (EAR’s) and the Site Energy Officers (SEO’s) helped with distributing Display posters and other awareness material connected with Display® and other energy awareness in general. _ The "Sustainable City Team", in their role of running the EMAS scheme within BCC helped with raising awareness and distribution of awareness material. Achievements Display® made it possible to convey to staff and citizens alike the message of energy efficiency in public buildings in a simple yet effective way through multiple media channels and actions. _ By doing so, there was a greater involvement of the building users in energy and water management in Bristol.. The coordinators of Display in Bristol have managed to ensure a growing visibility of Display® in the city. Awareness was attained especially through the large number of posters visible to the public. Lessons Learnt Using Display® has enabled the Council to give a "corporate identity" to the campaigns conducted by the EMU. The logo is readily identifiable and has been used on postcards, posters and newsletters, people now closely associate Display with the Energy Management Unit and energy awareness and this can only help our efforts to minimise energy and water waste in our buildings.